When I was 12 years old I remember a US Navy ship being bombed by air and torpedoed off the coast of Egypt. The result was 34 dead and 171 wounded, some crippled for life. The events took place in the larger context of the Arab-Israeli "Six Day War" during which Israel took the Golan Heights and the West Bank - in short, all those places that were eventually settled and complicate the Mid East situation to this day. I also remember that the story just faded away- and after about a week or so- it simply vanished. Years later while serving in the Navy I ran across several people that had been serving in the Eastern Med at the time of this incident. This only fueled my curiosity. Written painstakingly by the son of the Liberty's engineering Officer, Ensign John Scott, the book accesses many of the recently declassified documents to paint a picture of a deliberate and vicious attack that defies explanation even to this day. The Liberty was beyond the 12 mile limit and in International waters when repeatedly "buzzed" by Israeli jets. The ship remained on station, clearly marked and flying the large 7 foot by 13 foot "holiday" sized American flag from it's main mast amidships. Several hours later the jets returned and napalmed the ship without warning. Then to make matters worse Israeli torpedo boats raced to the scene and torpedoed the ship. It was only the actions of a well trained crew that saved the vessel from sinking- which is exactly what the Israeli government had in mind. The speculation never ends- was the attack in error as claimed by the Israeli's? If so, then why did they send torpedo boats to sink her after realizing the mistake? And why were the liferafts straffed Nazi style and made unusable? 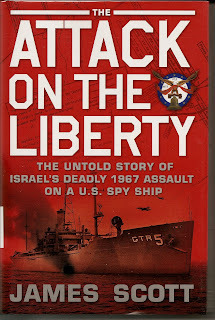 Why did the Israelis' block the radio frequencies that would have alerted other ships to come to the Liberty's aid? And finally, when the ship would not sink, why did the Israeli Navy offer to lend assistance? The possibilities are many fold. Mistaken identity, although improbable, would have meant that the Israeli's would have sent out boats to assist and not continue the attack. The liferafts being straffed causes one to believe that they wanted no survivors. The jamming of the frequencies was done to keep the ship isolated- possibly to blame the Egyptians and bring the US into the war on the side of Israel. The lame and belated attempt to assist the crippled vessel may have been an effort to gain control over the sensitive crypto gear that the Liberty was using to "eavesdrop" on the war. These are the scenarios that I have always held forth concerning this attack. At home in Washington, President Johnson , with his hands full as the Vietnam War rages out of his control, seems more concerned with angering an ally in the Middle East than in pressing for reparations. President Johnson, by his inaction in holding Israel accountable for the attack, set the stage for the capture by North Korea of the USS Pueblo a mere 8 months later. At one point the Joint Chiefs of Staff actually consider sinking our own ship to hide the evidence of the attack- maybe to even blame the Russians. Added to this is the Presidents concern that taking Israel to task would cost him much needed support from American Jewish organizations in the 1968 elections. Ironically, Johnson would never run in that race. Some things will never be clear concerning these events- but this is a remarkable read. It is not a condemnation of Israel. It is just another of the many stories from the Cold War- a time when being in the Service was like playing chess with real pieces.